Edward Grim was a clerk from Cambridge who was visiting Canterbury Cathedral on the day that Thomas Becket was murdered. Four other men, John of Salisbury, William FitzStephen, Benedict of Peterborough and William of Canterbury were also in the cathedral at the time and later wrote about what they saw. However, only Grim was with Becket when he was murdered. Grim attempted to protect Becket and during the struggle he was severely wounded. 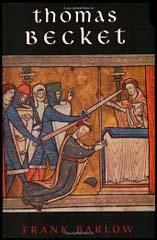 Grim researched and wrote a biography of Thomas Becket between the years, 1170 and 1177. The four knights with one attendant entered. They were received with respect as the servants of the King. The servants who waited on the Archbishop invited them to the table. They rejected the food, thirsting rather for blood. The Archbishop was informed that four men had arrived who wished to speak with him. He consented and they entered. The knights sat for a long time in silence. After a while, however, the Archbishop turned to them, and carefully scanning the face of each one he greeted them in a friendly manner, but the wretches, who had made a treaty with death, answered his greetings with curses. Fitz Urse, who seemed to be the chief and the most eager for crime among them, breathing fury, broke out in these words, "We have something to say to thee by the King's command.... The King commands that you depart with all your men from the kingdom... from this day there can be no peace with you, or any of yours, for you have broken the peace." The Archbishop said, "I trust in the King of heaven, who suffered on the Cross: for from this day no one will see the sea between me and my church.... He who wants me will find me here." The knights sprang up and coming close to him they said, "We declare to you that you have spoken in peril of your head." "Do you come to kill me?" he answered. As they went out, he who was named Fitz Urse, called out, "In the King's name we order you, both clerk and monk, that you should take and hold that man." The Archbishop returned to where he had sat before, and consoled his clerks, and told them not to fear; and, as it seemed to us who were present - it was him alone that they wanted to slay... We asked him to flee, but he did not forget his promise not to flee from his murderers from fear of death, and refused to go. 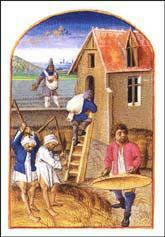 The knights came back with swords and axes and other weapons fit for the crime which their minds were set on... The knights cried out, "Where is Thomas Becket, traitor to the King?" Becket... in a clear voice answered, "I am here, no traitor to the King, but a priest... I am ready to suffer in His name... be it far from me to flee from your swords." Having said this, he turned to the right under a pillar... and walked to the altar of St. Benedict the Confessor... The murderers followed him; "Absolve", they cried, "and restore to communion those whom you have excommunicatec and restore their powers to those whom you have suspended." He answered, "I will not absolve them." "Then you shall die," they cried. "I am ready," he replied, "to die for my Lord... But in the name of Almighty God, I forbid you to hurt my people." They then laid hands on him, pulling and dragging him, that they might kill him outside the church. But when he could not be forced away from the pillar, one of them pulled on him. He said "Touch me not, Reginald; you owe me fealty; you and your accomplices act like madmen." The knight, fired with terrible rage, waved his sword over the Archbishop's head. Then he received a second blow on his head from Reginald Fitz Urse but he stood firm. At the third blow he fell on his knees and elbows... and saying in a low voice, "For the name of Jesus and the protection of the Church I am ready to embrace death." Then the third knight (Richard Ie Bret) inflicted a terrible wound as he lay, by which the sword was broken against the pavement... the blood white with the brain and the brain red with blood, dyed the surface of the church. 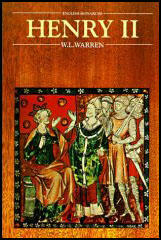 The fourth knight (Hugh de Morville) prevented any from interfering so the others might freely murder the Archbishop. The priest (Hugh of Horsea) who had entered with the knights... put his foot on the neck of the holy priest, and, horrible to say, scattered his brains and blood over the pavement, calling out to the others, "Let us away, knights; he will rise no more."